La Gloria Cubana Coleccion Reserva | Chicago's Pipe, Cigar & Tobacco Store | Iwan Ries & Co.
Ernesto Perez-Carrillo is back with General Cigar Co.—sort of. 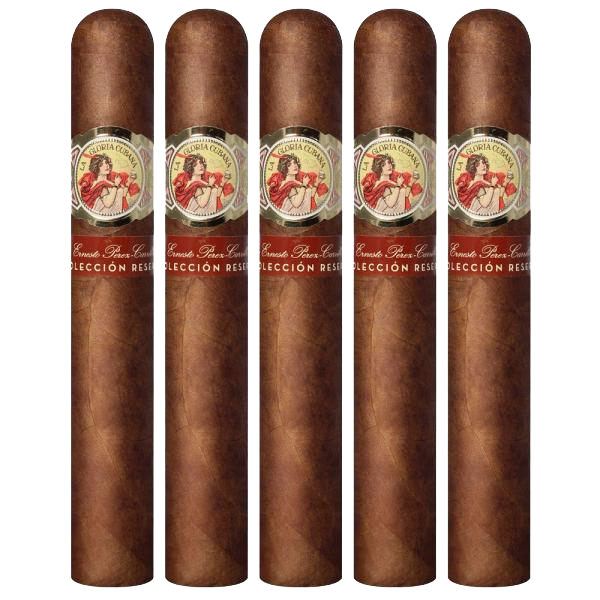 The two have teamed up for a new collaboration called La Gloria Cubana Colección Reserva. It's a regular-production line that will debut next month at the IPCPR trade show. that were available at the time. The Nicaraguan visos and ligeros that we use for this project are La Gloria all the way." Based on a blend he created in the 1980s, the new cigar is made with a Sumatra-seed wrapper grown in the Los Rios province of Ecuador's Quevedo region. The rest consists entirely of Nicaraguan tobacco. "Sumatra has a certain texture," Perez-Carrillo said. "A certain silkiness and a particular smell. I think it's a tangy wrapper, peppery and medium to full bodied." The La Gloria Cubana Colección Reserva is packaged in 20-count boxes and comes in three sizes: Robusto, measuring 5 inches by 54 ring gauge; Torpedo, 6 by 54; and Presidente, 7 1/2 by 54. They're set to retail from $7.59 to $8.99. The nonCuban La Gloria Cubana blend was created in Miami in 1972 at the El Credito cigar factory, but wasn't the focus until Perez-Carrillo took over the company in 1980. It gained a cult following and, by the 1990s, eventually grew into a national brand causing Perez-Carrillo to move his production to the Dominican Republic in order to meet demand. La Gloria Cubana got the attention of General Cigar, which purchased the brand in 1999 and offered Perez-Carrillo a job. He accepted, and stayed with General for 10 years, developing brands like La Gloria Cubana Serie R and La Gloria Cubana Artesanos de Miami. In 2009, he parted ways with General and later branched out on his own. La Gloria Cubana is often characterized as the quintessential boutique brand, due to its small, Miami-made roots, limited availability (in the early days) and respect among cigar connoisseurs. "It's the mother of all boutique brands," said General Cigar president Régis Broersma to Cigar Aficionado. This isn't the first time that Perez-Carrillo has collaborated with General since he left the company. In 2014, the two created a one-off brand called Re+United. Unlike Re+United, which was made at the General Cigar Dominicana factory, the new La Glorias are made at Perez-Carrillo's Tabacalera La Alianza factory, also in the Dominican Republic. Although owned and distributed by General, the new La Gloria Cubana Colección Reserva allows Perez-Carrillo to work with his own creation once again. When asked about his feelings toward La Gloria, he answered: "I still feel very close to the brand."